After the Roman defeat at Cannae, many peoples and cities in Southern Italy defect to Hannibal, but the Latin communities remain loyal to the Roman cause. Fabius’ six-month term as dictator had now expired. Since the consuls were with the armies in the field, another dictator, Lucius Veturius Philo, was nominated to preside over the election of the new consuls. His appointment turned out to be invalid because of bad auspices, and a series of interreges had to be appointed by the Senate to make sure that the consular elections could take place at all. Gaius Terentius Varro was elected as the first consul, and under his direction Lucius Aemilius Paullus was elected as the second. Varro’s career had been somewhat unconventional. Like his predecessor Flaminius he was a new man and a plebeian. Livius repeats the ridiculous story that he was “a man of humble and even mean origin”, whose father was a butcher (lanius). No doubt this story was made up later by his political enemies. In reality, Varro was a member of the equites who had held most of the offices in the cursus honorum. What was special, was that he had been both plebeian and curule aedile, the former office open only to plebeians and the latter to both classes. Rome had plenty of experienced commanders in the field this year. Lucius Aemilius Paullus had been consul before just three years previously and had in this capacity defeated the Illyrian pirates. The fact that he was allowed to hold the highest office again so soon either indicates that there was no strict law or convention yet that stipulated that there should be a ten year interval between two successive consulships, or that the Romans bended the rules a little in times of crisis. The commands of Servilius Geminus and Marcus Atilius Regulus, last year’s consuls, were prolonged by the Senate. Two former consuls served as praetors this year, Marcus Claudius Marcellus (consul in 222 BCE) and Lucius Postumius Albinus (consul in 234 BCE and again in 229 BCE). Although it later became unusual, at this point in time it was quite normal for former consuls to serve as praetors after their consulships. The two consuls were given joint command of perhaps the largest army ever raised by the Romans up until then. It comprised between 86.000 and 87.200 men, depending on the source, and probably included eight legions and eight alae of allied troops. Although these numbers were impressive, at least half of the soldiers were raw recruits. Furthermore, it was not easy to manoeuvre with such a large force, nor to provision it. Cannae and environs (source: Ancient World Mapping Center. “À-la-carte”; CC BY 4.0). Hannibal, on the other hand, had no such problems. His smaller and more experienced force set out from Gerunium and captured the Roman supply station of Cannae. The loss of so many supplies was another blow for Rome. To add insult to injury, the consuls disagreed on what strategy to adopt, or at least that is what our sources want us to believe. With such a huge army, it seems clear that both wanted to engage their opponent, but Paullus advised against attacking Hannibal at Cannae, because the flat terrain clearly favoured the Carthaginian cavalry. Varro was much more aggressive, or at least is depicted as such in our sources. He was no doubt encouraged by the fact that a Carthaginian attack on the Roman vanguard had failed. The Romans now made camp near the river Aufidus (now called the Ofanto). In fact they built two camps, a large one on the left bank and a smaller one on the right. Hannibal had followed the Romans and had ultimately also shifted his camp to the left side of the river, directly opposite the larger of the two Roman camps. On 31 July, the Carthaginian general told his men to prepare for battle, and on 1 August, he offered battle on the plain in front of the large camp. Paullus was in command that day – it alternated between the two consuls on a daily basis – and refused to accept. Hannibal then sent his agile Numidian cavalry across the Aufidus to attack foraging parties gathering water for the smaller camp. On 2 August, command of the entire army rotated back to Varro again. The consul decided to raise the red vexillum in front of his tent, indicating to his men that he was ready to fight. It seems very unlikely that he decided this without consulting his staff officers, and he certainly must have discussed his options with Paullus. Varro did decide to offer battle on the other side of the river, where the smaller camp was located. The consul marched his troops across the Aufidus and deployed most of his army on the plain between the river and a hill, perhaps the hill on which the town of Cannae itself was situated. Some 10.000 men were left behind to guard the large camp and attack the enemy camp during the battle. 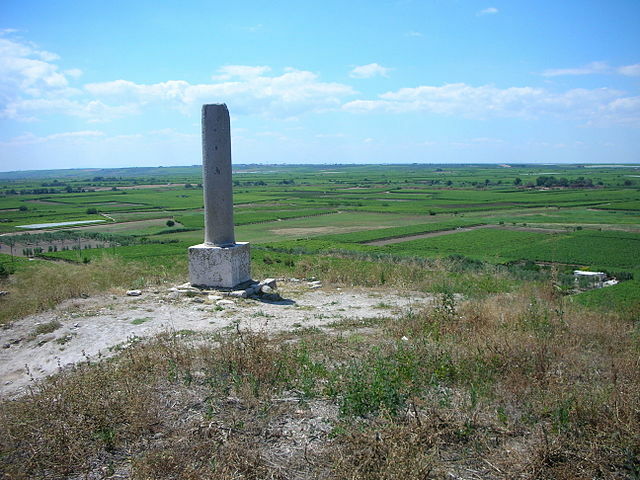 Monument on the fields of Cannae (photo: Jörg Schulz, CC BY-SA 3.0 license). The battlefield seemed to favour the Romans, as a flanking attack would be difficult because of the river and the hill. But the space between the river and hill was not very wide, perhaps some two or three kilometres only. This meant that Varro could not deploy his huge army in the usual battle formation, as there simply was not enough room for so many men. The consul therefore deployed his maniples in a very deep, almost column-like formation, drastically reducing their frontage. There were usually wide intervals between the maniples, to facilitate manoeuvring and to prevent the units from becoming entangled. Varro had to reduce these intervals too. This unusually deep formation did give his maniples great staying power. This mattered, as many of his troops were awfully green. However, the formation also reduced their attack strength, as only the men in the front rank fought, and its flexibility was extremely limited. Hannibal’s army consisted of some 40.000 infantry and 10.000 horsemen. He was clearly outnumbered, and this made some of his subordinate commanders nervous. A certain Gisgo is said to have marvelled at the size of the Roman army, with Hannibal joking that the Romans had many men, but not one of them was called Gisgo. The Carthaginian general decided to accept Varro’s challenge and marched his army across the Aufidus. He deployed his infantry in a convex formation, with the Spanish troops and Celts in the centre and the experienced North Africans on the wings, presumably in a deep formation and perhaps somewhat hidden behind the other troops. His heavy Spanish and Celtic cavalry was commanded by Hasdrubal and deployed on the left flank, opposite the Roman cavalry. 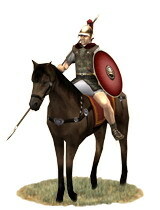 The Numidian horsemen were positioned on the right flank facing the allied Italian cavalry. Hannibal and his brother Mago commanded the infantry from close behind the fighting line. This was a risky position, but it was necessary. The outcome of the Battle of Cannae is well known: the Roman army was destroyed and Hannibal won his most decisive victory ever. Again, his cavalry proved to be the deciding factor. Hasdrubal and his experienced troopers quickly routed the Roman cavalry on the right flank, which was lead by Paullus. The consul was wounded by a slingstone, but managed to join the infantry nonetheless. Many of the Roman cavalrymen were not so fortunate, as they were massacred or chased into the river and off the field. The infantry battle initially seemed to develop as Varro had intended. The Roman centre pushed back the Spanish and Celtic foot soldiers so that the Carthaginian formation was now concave rather than convex. Varro began sending more legionaries and allies into the gap, expecting a breakthrough. As more and more Roman units joined the melee, they lost all formation, became entangled and basically turned into a big amorphous mass. But the Romans kept pushing on and Hannibal could very well have lost the battle here. Then suddenly his Africans on the flanks swung inward and attacked the flanks of the advancing Romans. These were taken completely by surprise and may have been confused by the fact that the Africans carried Roman arms and armour as well. The Roman advance was now halted. By this time, Hasdrubal had broken off his pursuit of the Roman cavalry. He regrouped his horsemen and threatened the allied Italian cavalry on the other flank in the rear. These horsemen, led by Varro, had so far only been skirmishing with the Numidians, but now faced an attack from two sides. The Italians panicked and galloped off the battlefield, with the Numidian horsemen in hot pursuit. Varro was gone too, so the Roman army had lost its overall commander. The Romans were now caught in a death trap. As the Spanish and Celtic foot soldiers reformed their line, Hasdrubal’s horsemen charged the Romans in the rear. Balearic slinger (image by Johnny Shumate (jjjshumate@earthlink.net)). The fighting went on for hours. The Romans were almost encircled, but put up some stiff resistance. Some men managed to get away, but most of the Roman army was annihilated. Livius give the Roman losses as 48.200 infantry and cavalry killed, which is about the same number as that given by Plutarchus, who claims that 50.000 Romans and allies were killed. Polybius provides an even higher figure of 70.000 killed, but that seems incredible, given the number of prisoners and the number of those who managed to get away. 29 military tribunes had lost their lives and so had 80 senators and men eligible for enrolment in the Senate. The proconsul Gnaeus Servilius Geminus and the former magister equitum Marcus Minucius Rufus had both been killed, and so had the consul Paullus and both quaestors. The other consul, Varro, had managed to escape with his life, taking only 70 horsemen with him to the Latin colony of Venusia. Thousands of Romans and allies were captured, including the 10.000 men left behind to guard the camp. But Carthaginian losses had been high as well. Between 5.700 and 8.000 men had been killed and many more had been wounded, and these are very high casualties for a victorious army. Hannibal’s army was clearly exhausted. 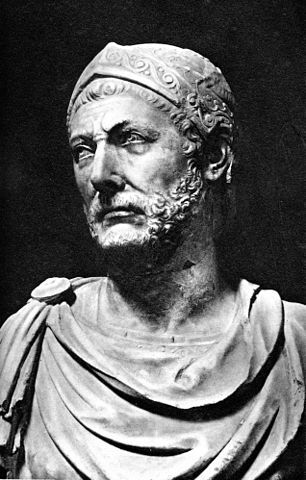 Maharbal, one of the cavalry commanders, encouraged Hannibal to march on Rome immediately, claiming it was a plum ripe for the picking: if he acted now, Hannibal could feast on the Capitoline Hill in five days. But Hannibal refused, and his decision made sense: his army needed to be rested, Rome was some 400 kilometres away and if the Romans did not surrender immediately, their city was much too large and too well fortified to be taken by storm. And even though they had lost tens of thousands of men, the Romans still had reserves. Maharbal’s complaint that “you know how to win victory, Hannibal, but not how to use it” seems rather unfair. 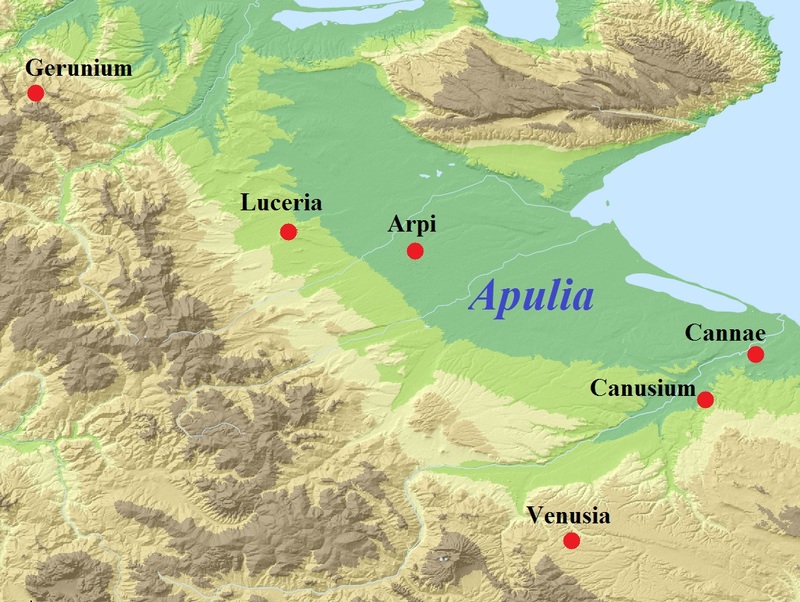 Many Roman survivors fled to the city of Canusium, southwest of Cannae. There a young tribune named Publius Cornelius Scipio, just nineteen or twenty years old, did his best to rally them. When Scipio discovered that several young noblemen led by one Marcus Caecilius Metellus made plans to leave Italy and take service with a foreign king, he drew his sword and made the men swear loyalty to the Roman Republic. Soon Varro arrived in Canusium too and took charge of the 10.000 or so survivors. When he had put things in order, he gave command of the troops to the praetor Marcellus and returned to Rome. In spite of later attempts to blame Varro for the defeat, the consul was actually given a warm welcome by the population. Yes, he had been soundly beaten, but like a true Roman commander he had not despaired. Varro was commended for rallying the survivors and would continue to hold important commands during the remainder of the war, although he never held the consulship again. The Romans now began asking themselves why they had been defeated. Earlier this year, they had arrested a Carthaginian spy in Rome. It is not clear whether the man was really a spy or just an innocent member of Rome’s Punic trading community, but in any case, the “spy” was expelled from the city after his hands had been cut off. After the Battle of Cannae, the later historian Quintus Fabius Pictor was sent to Delphi to consult the oracle on how to reduce the anger of the gods. In Rome itself, it was discovered that two Vestal Virgins had been unchaste, a crime which was punishable by death. One of the women was buried alive at the Porta Collina (Rome’s northernmost gate), while the other committed suicide. The Romans also resorted to the horrible but rare practice of human sacrifice to propitiate the gods. A Celtic and a Greek couple were buried alive on the Forum Boarium. The Romans took religious matter very seriously. 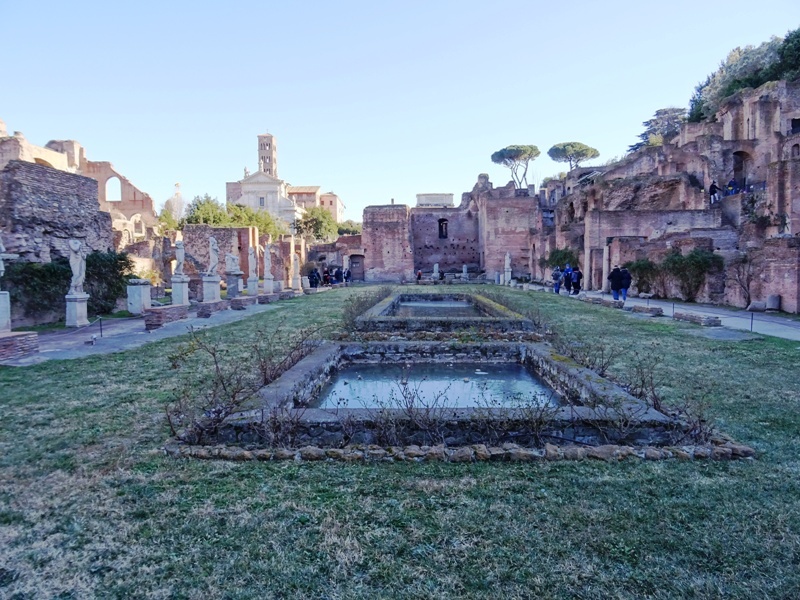 House of the Vestal Virgins on the Forum Romanum. Marcus Junius Pera was now appointed as dictator. He immediately began raising four new legions. Weapons and armour captured during previous wars were taken from the temples to equip men too poor to bring their own war gear. The Romans may also have lowered the property qualifications for serving in the legions and they certainly started recruiting 17-year-olds and even younger boys. Some 8.000 slaves – the so-called volones – were armed at the expense of the State. Pera would later even recruit criminals, including convicted murderers, offering them their freedom in return for serving in the legions. A further 6.000 men – many of them not criminals in the modern sense of the word, but debtors – were recruited in this way and equipped with Celtic weapons and armour that had been paraded through the city during Flaminius’ triumph in 223 BCE. When the survivors from Cannae returned to the city, they were formed into two new legions. These “Cannae legions” were sent to Sicily and were not allowed to return to Italy until the war had been won. The Roman response was not what the Carthaginians had expected. Nations that had been soundly beaten in three consecutive battles and that had suffered close to 100.000 casualties were expected to sue for peace. But not the Romans. Although Hannibal opted against marching on Rome, he did send a Carthaginian nobleman named Carthalo to the Senate, accompanied by ten high-ranking Roman prisoners of war (the Italian allies had been released without ransom again). Carthalo’s principal assignment was to name the Carthaginian price for the release of these prisoners and the thousands of others held by Hannibal. But he was also ordered to gauge the mood of the Senate and if possible offer peace terms. To his astonishment, the Senate refused to meet him and sent him away. The Senate furthermore decided not to ransom any prisoners, as this would only bolster Hannibal’s financial position. No doubt at this point in the war, Rome was in a state of financial crisis. A few years later, she would complete certain monetary reforms which led to the introduction of the famous silver denarius. The Roman defeat at Cannae led to many of Rome’s allies in Southern Italy to desert her, although not all of them deserted immediately nor at the same time. Many only defected when threatened by a Carthaginian army. 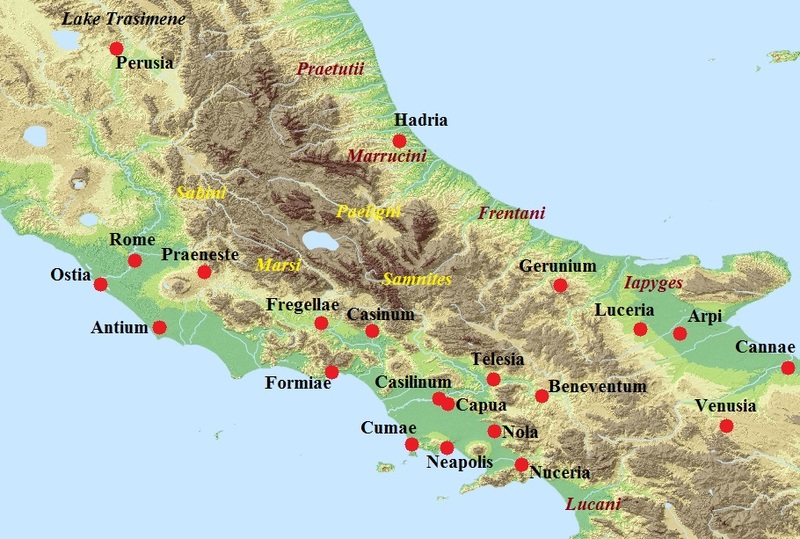 The most important among the defectors were the Samnites, Lucani and Bruttii, and several Campanian and Greek cities. After having rested his army, Hannibal marched into Campania again. The general needed to conquer a city with a sizeable port to establish a connection over sea with Carthage and to facilitate the sending of reinforcements. His target was now the Greek city of Neapolis (present-day Naples). But Hannibal’s army was built for speed, not for sieges and Neapolis’ walls proved too strong for him. Hannibal then decided to set his sights on Capua. 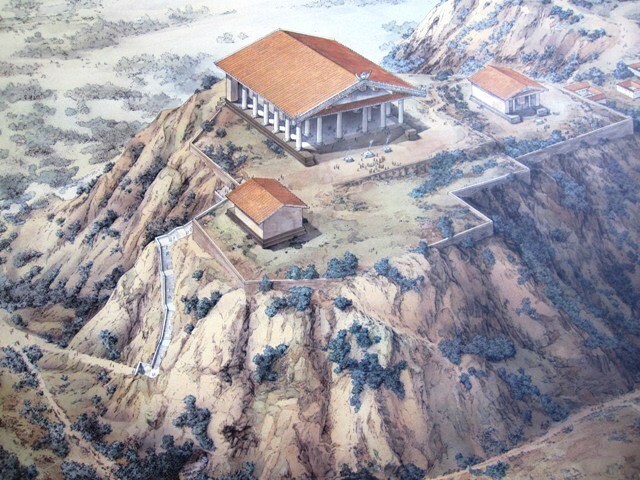 Capua did not have a port, but was one of the largest and richest cities in all of Campania. Map of Middle and Southern Italy (source: Ancient World Mapping Center. “À-la-carte”; CC BY 4.0). Ties between Rome and Capua had been strong since 343 BCE, the year in which Rome sent an army to Campania to protect the Capuans against the Samnites. After the appointment of Roman prefects in Capua in 318 BCE, Rome began to dominate Capuan politics, but the Capuans retained their own magistrates, senate and assembly. Over the years, many inhabitants of the city received Roman citizenship without the right to vote (civitas sine suffragio). Intermarriage between Romans and Capuans was common and many noble families on both sides were connected. As a large and rich city, Capua provided the Roman army with thousands of soldiers. But in spite of these strong bonds, the Capuans decided to defect to Hannibal. This may simply have been for opportunistic reasons: Hannibal seemed to be winning the war, and the Carthaginian general also allegedly promised to make Capua the new capital of Italy. In this capacity she would dominate all the other Italian peoples, including the Romans. This was an offer the Capuans could not refuse. The Roman prefects and other Roman citizens were arrested and the gates of the city were opened for Hannibal and his army. After Cannae, Hannibal had sent his brother Mago to Bruttium in the toe of Italy to arrange for the defection of the Bruttii. 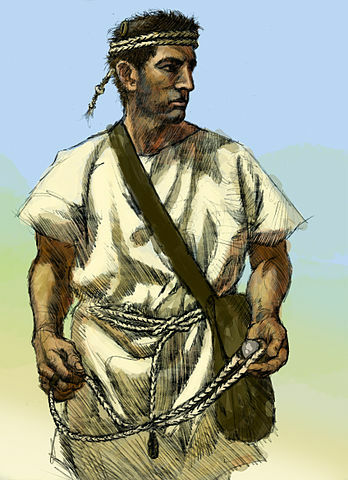 When he had accepted their submission, Mago travelled back to Carthage to report on his brother’s victories. The members of the Council of Thirty Elders were awed when he poured heaps of golden rings onto the floor of all the senators and equites that had been killed. But when asked by Hanno the Great how many Latin communities had defected to Hannibal, Mago had to admit that none had done so yet. The Council nevertheless decided to send a small force of reinforcements to Italy, comprising 4.000 Numidians and 40 elephants. These were probably sent to Locri in the toe of the Italian peninsula, which had defected to Hannibal or would soon defect. The Elders then sent Mago to Spain, accompanied by a high official. They were to order Hasdrubal to raise an army of some 24.000 men and lead it to Italy over land to link up with Hannibal. There was some more action in Italy this year, with Hannibal sacking Nuceria and Acerrae and threatening Nola. Part of the population of Nola was prepared to defect to Hannibal, so the praetor Marcellus was sent from Casilinum to prevent this. Marcellus did his job well, winning a small-scale but morale-boosting battle near the town, the first of three Battles of Nola. Hannibal then led an unsuccessful attack on Casilinum before he decided to withdraw to his winter quarters at Capua. He still had every reason to believe that the war would be over in months. Polybius, The Histories, Book 3.106-3.118 and Book 6.58. Richard Miles, Carthage must be destroyed, p. 277-287. An interrex – a relic from Rome’s Regal period – was chosen from among the patrician senators. He held his “office” for just five days. The Senate kept electing interreges until the elections had been held. The ten year interval was perhaps introduced by a Lex Genucia of 342 BCE (see Livius 7.42), but even if this is the case, it seems to have been ignored on many occasions. Spoils of war from previous battles. Plutarchus claims he was Fabius Maximus’ kinsman. Pictor wrote a history of Rome in Greek, which has not survived. The Romans did not begin minting silver coins until ca. 268 BCE. A denarius was initially worth 10 copper asses and 2,5 sestertii, which was later (after 150 BCE) changed to 16 asses and 4 sestertii. Livius claims they were locked up in bathhouses and died of asphyxiation because of the unbearable heat (Livius 23.7). His claim seems a little far-fetched. 300 Campanian horsemen, mostly from Capua and serving on Sicily, remained loyal to Rome. They would be granted full Roman citizenship the next year (Livius 23.31).